Fixed-film Activated Sludge (AESFAS) Technology/Package provides for additional biomass within a wastewater treatment facility in order to meet more stringent effluent parameters or increased loadings without the direct need for additional tank capacity. Industry practice for upgrading wastewater treatment plants usually focuses on increasing the bioreactor volume to provide the additional bacterial population required to meet the system kinetic needs. 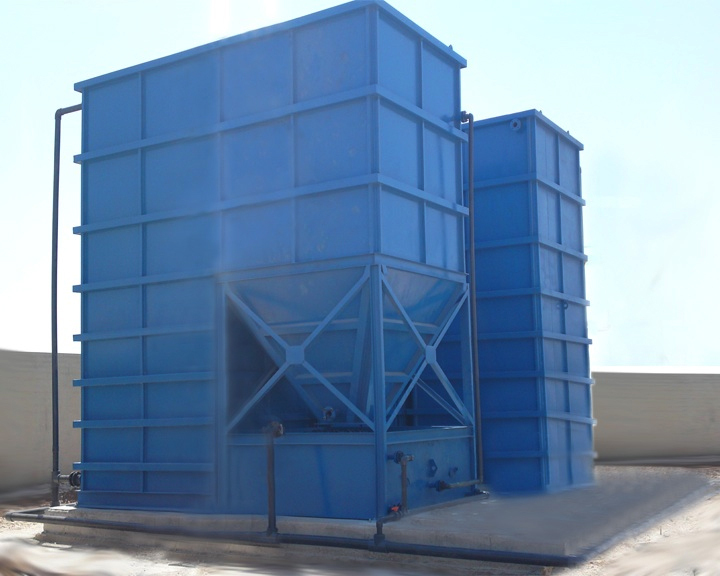 However, designers often encounter clarifier solids loading limitations that put an upper limit on the amount of biomass that can be carried in the suspended growth system. AESFAS systems such as MBBR allow for the additional bacterial population to exist on a fixed surface, thereby eliminating the need to increase the suspended growth population. AESFAS systems add the benefits of Fixed Film systems into the suspended growth Activated Sludge process. Activated Sludge has process flexibility and provides a high degree of treatment. Fixed Film processes are inherently stable and resistant to organic and hydraulic shock loadings. Placing Fixed Film media into Activated Sludge basins combines the advantages of both of these approaches. The Moving Bed Biofilm Reactor or MBBR process is based on the aerobic biofilm principle and utilizes the advantages of activated sludge and other biofilm systems without being restrained by their disadvantages. The basis of the process is the biofilm carrier elements that are made from polyethylene. The elements provide a large protected surface area for the biofilm and optimal conditions for the bacteria culture to grow and thrive. The biofilm that is created around each carrier element protects the bacterial cultures from operating excursions to yield a very robust system for those industrial facilities loaded with process fluctuations. The biofilm also provides a more stable “home” for the bacteria to grow, so there is less space required compared to other biological systems and far less controls. Essentially nutrient levels and DO levels are the only control points for the system. Phosphorus removal or higher BOD/COD capacity (up to 500% increases have been obtained). The reliability and ease of operation has provided satisfaction to over 350 customers worldwide. Municipal/industrial wastewater facilities for both new construction and upgraded plants in many variations of suspended growth systems. When included in new plant design, reduced tank volumes result. New tanks must be designed to incorporate fixed or dispersed media and additional auxiliary screens should be added if a dispersed AESFAS/MBBF media reactor is chosen. Similarly, in retrofit applications, increased treatment capacity may be realized, along with the other benefits of fixed film type processes. The existing aeration capacity needs to be evaluated to determine whether it is adequate for the increased BOD removal and biomass respiration expected with the higher level of treatment performance associated with AESFAS/ MBBR. Media installation needs to be planned carefully to ensure that the existing basins can accommodate the fixed media modules or dispersed media systems. The fixed biomass increases the Sludge Retention Time (SRT), promoting better nitrification compared to simple suspended growth systems. During cold weather and where lower compliance limits are imposed, the added biomass improves the performance of nitrifying plants, or even allows non-nitrifying plants to nitrify. Recent research indicates that autotrophic bacteria tend to grow more readily on fixed-film surfaces than in a suspended growth environment. By increasing the bacterial population (Microorganism) with the fixed-film component for a given loading (Food), the F/M ratios are lowered. Alternatively, loadings may be increased while maintaining F/M ratios. Typically, lower F/M systems are more stable than higher F/M systems. AESFAS/MBBR system studies and reports from owners and engineers consistently demonstrate reduced sludge production. Studies indicate that reduction in sludge production or wasting rates is expected where F/M ratios are reduced, or where the waste sludge solids concentration is higher. In various studies and discussions with practitioners, it has been noted that the Sludge Volume Index (SVI) improves and has less variation when AESFAS/MBBR upgrades are implemented. The continual sloughing of the fixed film component into the suspended growth environment is the key to this characteristic. Reductions in SVI values of 25-40% have been reported in the literature. Improved SVIs allow for a more concentrated Return Activated Sludge (RAS), thereby reducing the return sludge flow requirements, saving power, and improving process control. AESFAS/MBBR systems can increase the effective MLSS in an aeration basin by as much as 3000 mg/l. The additional biomass can offset the need for additional aeration basin capacity. Furthermore, AESFAS/MBBR systems can also be designed to specifically “off-load” clarifiers by shifting an appropriate portion of the bacterial population to the fixed film. This is particularly effective in applications with limitation on the clarifier solids loading, which often limits the MLSS content of the aeration basins. Biomass populations in AESFAS/MBBR aeration basins are not susceptible to washout during hydraulic surges as they are in suspended growth systems without AESFAS/MBBR because they are fixed in place. Additionally, the fixed biomass acts as a source of seeding to help return the system to normal operations quickly after such a surge. System nitrification is also restored faster since a large mass of nitrifies is retained on the fixed-film. The fixed-film component continues to provide treatment while the mixed liquor suspended solids inventory is rebuilding. This can mitigate or prevent permit excursions, depending upon the amount of fixed-film biomass in the system. The depth of biomass provided on fixed film also resists organic shocks better than does suspended biomass. • For new installations, AESFAS/MBBR systems will generally require less tank capacity and therefore have less capital cost than a conventional AS system. • For retrofits of existing AS systems to address increased capacity or improved BNR, AESFAS/MBBR systems represent a cost-avoidance associated with the additional tank capacity that would otherwise be required for additional AS capacity. • AESFAS/MBBR systems require little or no additional operational costs or operating staff over conventional AS. In this plant, the tanks were constructed vertically to save space while maintaining mobility.